"Adversaries are developing kinetic, directed-energy, and cyber tools to deny, degrade, and destroy our space capabilities," Hyten said in a prepared statement for a hearing of the House Armed Service strategic forces subcommittee. "They understand our reliance on space, and they understand the competitive advantage we derive from space. The need for vigilance has never been greater," the four-star general said. "Simply stated, there isn’t a single aspect of our space architecture, to include the ground architecture, that isn’t at risk," Buck said. "Russia views U.S. dependency on space as an exploitable vulnerability and they are taking deliberate actions to strengthen their counter-space capabilities," he said. China in December created its first dedicated space warfare and cyber warfare unit, called the Strategic Support Forces, for concentrating their "space, electronic, and network warfare capabilities," Buck said. "China is developing, and has demonstrated, a wide range of counter-space technologies to include direct-ascent, kinetic-kill vehicles, co-orbital technologies that can disable or destroy a satellite, terrestrially-based communications jammers, and lasers that can blind or disable satellites," Buck said. "Moreover, they continue to modernize their space programs to support near-real-time tracking of objects, command and control of deployed forces, and long-range precision strikes capabilities," the three-star general said. Douglas Loverro, deputy assistant defense secretary for space policy, also warned about growing threats to satellites and outlined U.S. plans to deter future attacks. Loverro said the United States does not want a war in space. "But let me be clear about our intent—we will be ready," he said. None of the five Pentagon and intelligence officials who took part in the budget hearing for military space efforts mentioned any U.S. plans or programs to develop anti-satellite missiles and other space weapons for use against Chinese or Russian space systems. The subcommittee, however, held a closed-door session after the public hearing. A modified U.S. missile defense interceptor, the SM-3, was used in 2008 to shoot down a falling U.S. satellites in a demonstration of the country's undeclared anti-satellite warfare capability. Loverro suggested U.S. defense and deterrence of space attacks could involve counter attacks, possibly on the ground or in cyber space. But he provided no specifics. "Today our adversaries perceive that space is a weak-link in our deterrence calculus," Loverro said. "Our strategy is to strengthen that link, to assure it never breaks, and to disabuse our adversaries of the idea that our space capabilities make tempting targets." Many of the most important navigation, communications, and intelligence satellites were designed during the Cold War for use in nuclear war and thus incorporate hardening against electronic attacks, Loverro said. For conventional military conflict, however, adversaries today view attacks on U.S. satellites as a way to blunt a conventional military response what Loverro called the "chink in the conventional armor of the United States." "In this topsy-turvy state, attacks on space forces may even become the opening gambit of an anti-access/area-denial strategy in a regional conflict wherein an adversary seeks to forestall or preclude a U.S. military response," he said. "Chinese military strategists began writing about the targeting of space assets as a ‘tempting and most irresistible choice’ in the late 1990s, and the People’s Liberation Army has been pursuing the necessary capabilities ever since," he said. Rather than threatening foreign states’ satellites, Loverro said deterrence against foreign nations’ space attacks is based on defending against missile strikes or other attacks and making sure satellite operations will not be disrupted in war. That would be carried out through partnering with the growing commercial space sector that is expected to deploy hundreds of new satellites in the coming years that could be used as back up systems for the Pentagon in a conflict. Deterrence also will be based on increasing foreign partnerships with allied nations in gathering intelligence on space threats and other cooperation. A space defense "offset" strategy will seek to reduce the advantage of using relatively low cost of missiles, small satellites, or cyber forces to attack U.S. satellites, Loverro said. "An advanced U.S. satellite might cost upwards of $1 billion; missiles that could destroy such a satellite cost a few percent of that sum; co-orbital microsatellites cost even less; and lasers that might blind or damage satellites have an unlimited magazine with almost zero cost per shot," Loverro said. Deploying large numbers of low-cost satellites will not offset those advantages, he said. Instead, Loverro offered vague plans for countering the threat. "A space offset strategy must employ a diverse set of resilience measures that complicate the technical, political, and force structure calculus of our adversaries, by arraying a complex set of responses, with few overlapping vulnerabilities and a combination of known and ambiguous elements," he said. Frank Calvelli, deputy director of the National Reconnaissance Office, the spy agency that builds and operates strategic intelligence and reconnaissance satellites, said a resurgent Russia and aggressive China are among several current national security threats. Calvelli revealed that the agency in October launched a new satellite that carried 13 smaller "CubeSats." "The NRO sponsored nine of the CubeSats while the National Aeronautics and Space Administration sponsored the remaining four," Calvelli said. 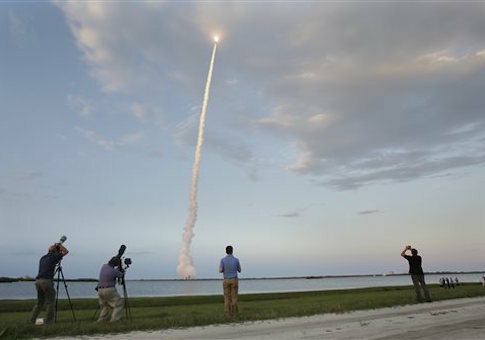 Among the missions of the CubeSats are software-defined radios "to provide beyond-line-of-sight communication for disadvantaged users in remote locations, and technology pathfinders to demonstrate tracking technologies, optical communications, and laser communication," he said. Four advanced intelligence-gathering satellites will be launched this year to support military operations and intelligence analysis and decision-making. Calvelli also said space threats are prompting the Reconnaissance Office to develop "better and faster" systems in space and on the ground, along with better overall "resiliency"—a term used by the military to signify an ability to operate during high-intensity warfare. The agency is investing substantial sums in bolstering defenses for space and ground systems to make them more survivable during space war. "We are more focused on survivability and resiliency from an enterprise perspective than we have ever been and we have made significant investments to that end," he said. The agency also is "improving the persistence of our space-based systems, providing greater ‘time on target’ to observe and characterize activities, and the potential relationship between activities, and to hold even small, mobile targets at risk," Calvelli said. It also is upgrading its ground stations, which are used to control and communicate with orbiting satellites, including an artificial intelligence system called "Sentient." "Sentient—a ‘thinking’ system that allows automated, multi-intelligence tipping and cueing at machine speeds—is just one of those capabilities," Calvelli said. New ground stations also are being deployed that will empower "users of all types with the capabilities to receive, process, and generate tailored, timely, highly-assured, and actionable intelligence," he said. The comments were a rare public discussion of the activities of one of the most secret U.S. intelligence agencies. Dyke D. Weatherington, director of unmanned warfare and intelligence, surveillance, and reconnaissance at the Pentagon, said eight national security satellites were launched in 2015, including tactical and strategic communications, and navigation, position, and timing satellites. Weatherington said the United States maintains a strategy advantage in space system but warned that is changing. "The rapid evolution and expansion of threats to our space capabilities in every orbit regime has highlighted the converse: an asymmetric disadvantage due to the inherent susceptibilities and increasing vulnerabilities of these systems," he said. While space threats are increasing, "our abilities have lagged to protect our own use of space and operate through the effects of adversary threats," Weatherington said. The Pentagon currently has 19 military-capable GPS satellites on orbit and a new generation of GPS satellites is being developed that will be produce signals three times stronger than current system to be able to overcome electronic jamming, he said. The officials at the hearing also discussed plans to transition from the sole reliance on the use of Russian-made RD-180 rocket engines to launch national security satellites. A new U.S. made engine, however, will not be fully developed until 2022 or 2023. This entry was posted in National Security and tagged China, Cyber Security, Military, Russia. Bookmark the permalink.